Think You Have A Dead Hearing Aid? When a hearing aid suddenly quits working, it can ruin a vacation, business meeting, or any hearing dependent activity. The good news is that with a few simple tools and a troubleshooting checklist, the cause of most sudden failures can be easily isolated and solved in just a few minutes. Most often when a hearing aid “just quits”, it's fairly simple to fix. Typically, sound travels from inside the hearing aid through the tube into the user's ear. Oftentimes, due to simple usage, the tube can become blocked with ear wax or other debris. When this occurs it can cause a hearing aid to stop working and prevent the sound from reaching your ear. Blockages are fairly common due to simple usage and can usually be solved by a simple cleaning. Remove the tube completely from the hearing aid. Put a fresh battery in the aid and turn the volume up all the way, then close your hand around the aid. 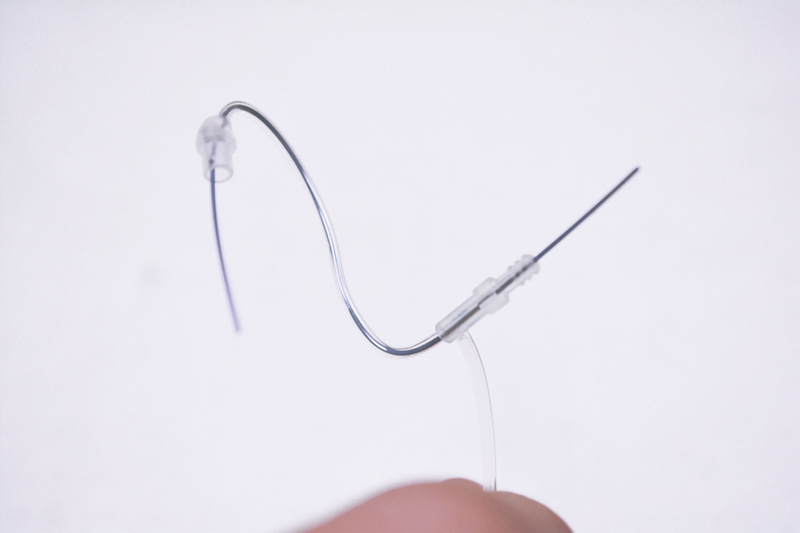 If the unit whistles or squeals with the tube removed, that indicates that the hearing aid is in fact working, but there is a blockage somewhere in the tubing. Clean the tubing. 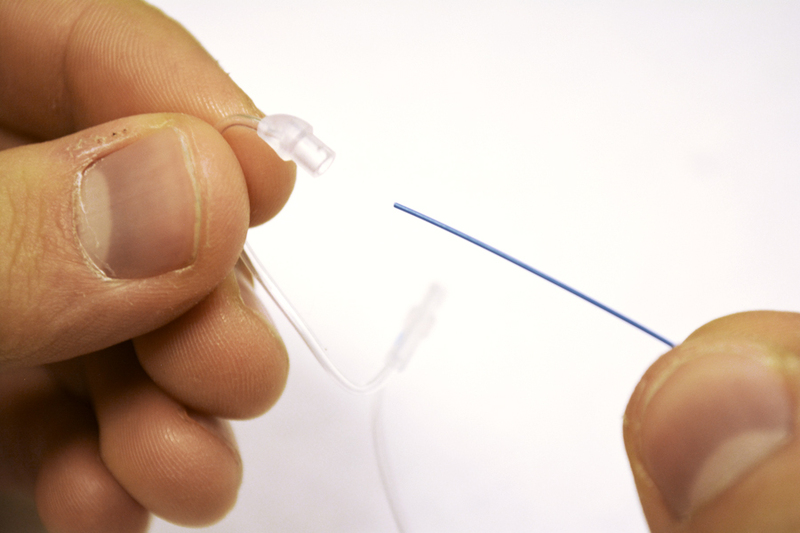 All Advanced Affordable Hearing Aid purchases come with a small wax-loop equipped brush and some blue plastic thread (cleaning filament) that are designed to poke through tubes and remove any debris. Gently push one end of the cleaning filament through your tube until it comes out the other end. Then use your brush to wipe away any debris. For larger blockages, the brush also has a looped wire attached to the handle which is a little stronger than the filament if necessary. Note: Blockages may also be caused if the tube is bent. If this is the case, it may be necessary to replace the tube with a new one. Replacement tubes aren't costly and can be easily purchased (see Toolkit below). If the hearing aid is still dead after performing the above procedures, there is one more thing to try. Since moisture is the most common cause of hearing aid failures, putting the dead hearing aid in a dry environment for a few hours can help. If traveling by vehicle, the use of the air-conditioned airflow out of a dash vent can act as a helpful source of dehumidified air. Also, you can try putting your hearing aid in a refrigerator (NOT the freezer) overnight. This will also have a drying effect. For a last resort, a possible fix you can try is using a pressurized spray-can marketed as ‘electronic duster’ to clear hidden plugs in your hearing aid. Sometimes called "Keyboard Dusters," the cans are available anywhere computer accessories are sold. First, start with the nozzle at a distance and DO NOT direct the full force of compressed air into the hearing aid, but rather at an angle. Use short bursts of air and test for operation often with a proven battery. If you are a hearing aid user, it is smart practice to have a hearing aid toolkit available that includes common cleaning items. When you purchase a hearing aid from Advanced Affordable Hearing, we typically include a wax-loop equipped brush and cleaning filaments along with the hearing aid. As mentioned above these are the recommended tools for clearing blockages. Another, useful tool for hearing aid maintenance is a magnifying glass with its own light. Frequent inspections of the sound path into and out of a hearing aid tube can help eliminates most "blockage" problems before they happen. If you have tried the suggestions mentioned in this article and your hearing aid is still not working, we do offer a cleaning and/or repair service for an additional charge. Give us a call at 800-804-0434 and speak to a support agent or send us an email to support@advancedaffordablehearing.com and we can help set you up for a cleaning or possible repair.